In London, where Michael Jackson’s 50 concert tour dates was set to begin soon, news of his death rippled throughout the city. At the Lyric Theatre, the Thriller Live show was originally created and performed to celebrate the accomplishments and musical influence of Michael Jackson, and it has now become a tribute to his life. The executive producer was a long time associate of Michael and the show still went on, even with the tragic news of his death. 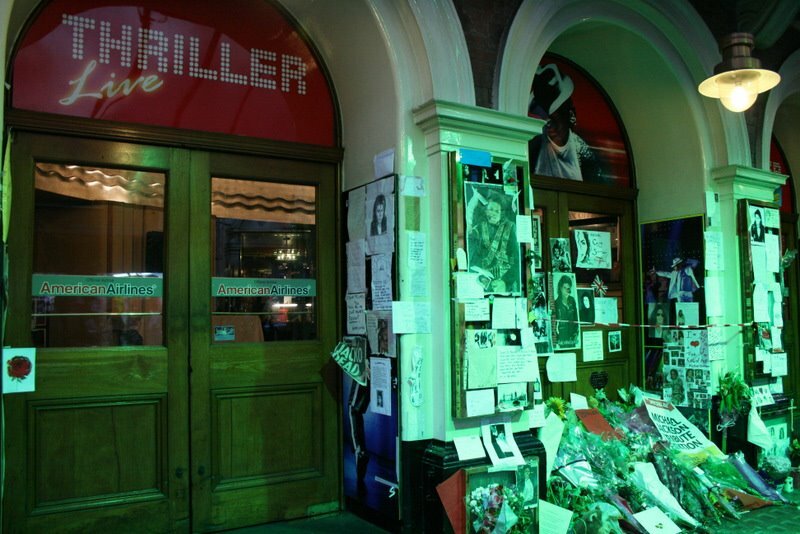 As expected, many Londoners likely had tickets to go see him at the O2 arena and this theatre was a fitting memorial site for fans to leave flowers, photos, notes and newspaper articles. I never realized how much a fan I was of the man and his music, but with the shocking news of his death, I went to my itunes and played his songs and remembered just how much of an impact it had in my life. I can remember listening to it ever since I was young, and listening to the music really made me realize just how great it was. Saddened that he can’t continue to make music and make the comeback that was all planned out for him. Despite all the controversy surrounding his life, nothing can take away from his music and his impact worldwide. RIP Michael Jackson.